The fantasy football waiver wire can often make or break your season. Making the right decision on which players to add and drop is crucial, so we have you set up with a deep list of potential waiver wire adds for Week 9. Ryan Fitzpatrick, TB (10-20%) — Here we go again. Jameis Winston is benched after last week’s debacle, so Fitzpatrick is back in play. For now. Mitchell Trubisky, CHI (10-20%) — Despite being a top-10 fantasy quarterback, Trubisky is still available in just over 27% of leagues. Aaron Jones, GB (25-50%) — Jones exploded against the Rams last week, but don’t get too carried away with him. Jamaal Williams was still involved and got work down near the goal line. The fantasy roller coaster for Jones will likely continue. Peyton Barber, TB (15-30%) — Barber hasn’t been willing to let go of the lead job in Tampa, and he all but solidified himself in that role after last week’s performance. And it doesn’t hurt the cause that Ronald Jones suffered a hamstring injury. Larry Fitzgerald, ARZ (50-100%) — The veteran is shockingly available in 25% of leagues. His arrow is pointing straight up after a resurgent fantasy week. Keke Coutee, HOU (25-50%) — With Will Fuller out for the season, Coutee should see an uptick in targets for the Texans. Jack Doyle, IND (15-30%) — Doyle finally got back on the field this past week and was immediately right back ahead of Eric Ebron in terms of routes run and target share. Dak Prescott, DAL (5-10%) — Prescott was surging before the Cowboys’ bye, and getting Amari Cooper only helps his fantasy value. Baker Mayfield, CLV (3-5%) — It’s tough to predict how Mayfield will fare under the interim regime, but his upcoming slate is a favorable one for fantasy purposes. Jalen Richard, OAK (10-20%) — While he wasn’t the lead back, Richard was heavily involved in the passing game last week. He offers plenty of PPR upside. Doug Martin, OAK (8-15%) — The veteran looked surprisingly spry in Week 8. He’s worth an add if you need help at running back, but we’re a bit wary that he wears down over the next two months. Wendell Smallwood, PHI (5-10%) — The Eagles backfield is still a mess, but if they don’t make a trade for a running back, Smallwood is the preferred fantasy option going forward. Mike Davis, SEA (5-10%) — Rashaad Penny didn’t see the field in Week 8, which puts Davis right back into the handcuff conversation. Ito Smith, ATL (5-10%) — The Falcons were on bye last week, but don’t forget about Smith. He’s going to continue to have a role in the offense with Devonta Freeman on injured reserve. Nyheim Hines, IND (5-10%) — With the Colts offense clicking, Hines is an intriguing upside option in PPR leagues. Duke Johnson Jr., CLV (3-5%) — Johnson doesn’t have major appeal, but he’s worth a dart throw with the chance that the interim coaching staff gets him more involved. 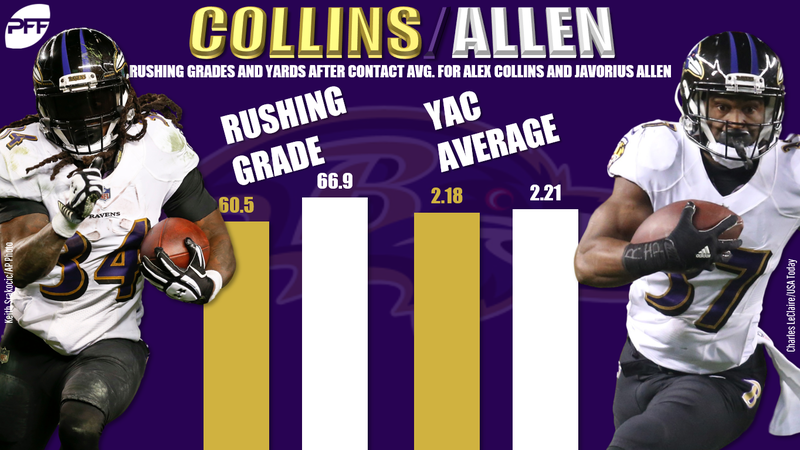 Javorius Allen, BAL (3-5%) — Alex Collins hasn’t been particularly effective this season, so there’s still a chance that Allen’s role increases down the stretch. Courtland Sutton, DEN (15-30%) — The rookie continues to look more and more comfortable in the Broncos offense. He offers an appealing ceiling for the fantasy stretch run. D.J. Moore, CAR (15-30%) — With Torrey Smith sidelined, Moore finally got an opportunity to play an every-down role and delivered. The genie is out of the bottle now. Tre’Quan Smith, NO (15-30%) — Last week wasn’t great, but Smith still screams upside for the fantasy stretch run. DeVante Parker, MIA (10-20%) — After doing essentially nothing all season, Parker exploded for 100-plus yards in Week 8. He’s a volatile add, but one who could pay dividends. 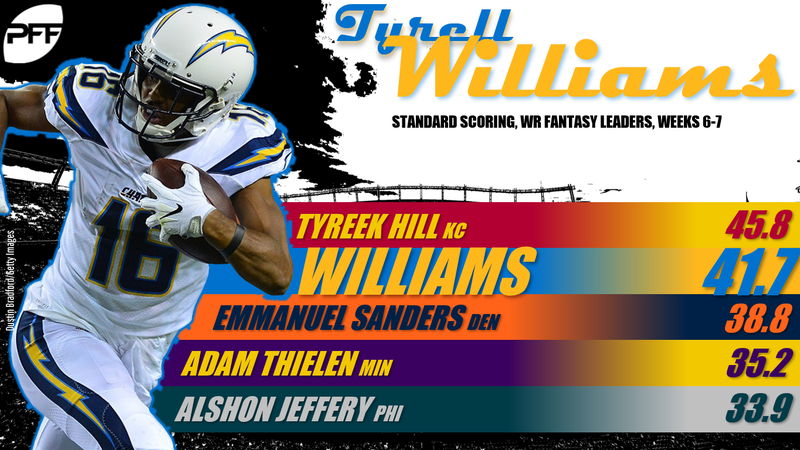 Tyrell Williams, LAC (8-15%) — He posted big fantasy days in back-to-back weeks before the Chargers’ bye. Danny Amendola, MIA (8-15%) — Injuries have thrust Amendola into the No. 1 role for the Dolphins. While that may sound very appealing, keep in mind that his upside is limited. Marquez Valdes-Scantling, GB (5-10%) — The Packers are now finding ways to get Valdes-Scantling the ball. His upside is very appealing as we approach the fantasy playoffs in just over a month. David Moore, SEA (3-5%) — Yes, he put up big numbers last week, but Moore is still clearly the No. 3 wideout in Seattle and that means volatility. Anthony Miller, CHI (3-5%) — The rookie got to play a three-down role this week and led the Bears in targets. He also found the end zone. Ed Dickson, SEA (3-5%) — The veteran tight end stepped right into the Seahawks offense after spending the first half of the season sidelined. Derek Carr, OAK (1%) — Carr was a surprise top-five fantasy play this week. He’s worth scooping up in deeper leagues. Elijah McGuire, NYJ (1%) — He’s eligible to return this week and should immediately factor into the Jets offense as a replacement for Bilal Powell. Josh Adams, PHI (1%) — The rookie running back continues to be the most effective early-down back in Philly. Malcolm Brown, LAR (1%) — If the worst-case scenario happened and Todd Gurley got hurt, Brown’s value would skyrocket. Rishard Matthews, NYJ (1-3%) — Matthews is still getting up to speed in New York but has an opportunity to produce down the stretch. Adam Humphries, TB (1-3%) — Though he’s overlooked in Tampa, Humphries is doing a good job on the field and is coming off double-digit targets in Week 8. Josh Doctson, WAS (1%) — Somebody has the catch the ball in Washington. Doctson hasn’t been able to reach his ceiling yet as a pro, but he’s worth a deep league dart. Jordan Matthews, PHI (1%) — Don’t read too much into last week’s box score. Matthews is the No. 3 in Philly and benefited from Jalen Ramsey shadowing Alshon Jeffery. Jordan Thomas, HOU (1%) — Yes, he did catch two touchdowns, but it’s tough to trust the rookie tight end as anything more than a deep league flier. Carolina Panthers (1%) — Ryan Fitzpatrick has been magical at times, but he’s also a player who has a six-interception game on his career resume. That’s enough to make the Panthers a priority streamer this week. Dallas Cowboys (1%) — Tennessee is currently surrendering the fourth-most fantasy points per game to opposing defenses with double-digit games allowed to two of their last three opponents. Oakland Raiders (1%) — If you’re desperate this week, the Raiders should be available. This isn’t a play for the faint of heart, but the 49ers have allowed 17 sacks and 12 giveaways over the last month.